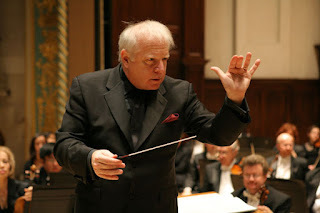 When Detroit Symphony Orchestra music director Leonard Slatkin suffered a heart attack on November 1, many of us were taken aback and immediately started sending positive energy his way. During the time since that day, his post-surgery recovery has been carefully guarded by the conductor, his management and the DSO. Maestro Slaktin has not spoken publicly about his ordeal since trading e-mails with the Detroit Free Press from his hospital bed two days after the attack. Well now, the cat's outta the bag. On his website, Maestro Slatkin details for us the events surrounding the attack and how he has been progressing since. During my week of rehearsals and concerts in Rotterdam, I had started to feel a bit out of breath, especially walking over to the hall. Being somewhat overweight, this was not out of the ordinary, but once in a while, I actually had to stop. This should have told me something. There were four concerts all together. During the first three, I got a bit winded and dizzy but got through the programs easily enough. At the first performance I felt I might actually fall forward off the podium and attributed this to simply not getting my balance. There were even moments when I knew I was losing concentration, but again, I ignored the signs, and attributed it to jet lag. The final performance was on Sunday, at 2:30 in the afternoon. I had brought my luggage to the hall, as my flight to Prague for the next set of concerts was set to leave at 8:30 pm. It is about an hour's drive from Rotterdam to Schipol airport in Amsterdam. Again, I got quite out of breath walking to the hall but this time the feeling did not dissipate, at least for a while. When I got to my dressing room, I was already huffing and puffing. The first piece on the concert was the 3rd Piano Concerto of Beethoven, not a particularly physical work for the conductor. As it progressed, I started to feel much better. However, during intermission, I started to experience the out of breath symptoms that had occurred an hour earlier. Someone actually asked me if I was okay and I said yes. To get the rest of the story, check out Maestro Leonard Slatkin's website. We continue to wish the Maestro well as he continues to gain strength. We are very much looking forward to his conducting Angela Gheorghiu in the MET Opera's La Traviata... that is, if she goes ahead with the contract.